Challenges included a requirement for responsive web design technologies to enable mobile, smartphone and tablet access for all content. WordPress was selected to be the content management system (CMS) for its ease of use and support for blogging as well as custom landing pages. A number of themes were considered and Twitter’s Bootstrap frame work selected. As a travelog is makes sense that the site be mobile friendly so the responsive web design features within the BootStrap framework are a central aspect of the site. 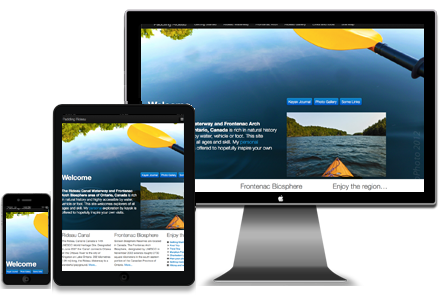 The site documents 4 kayaking adventures on the Rideau Waterway and uses custom Google maps to locate the journey points of interest. To tell the story on chronological order the typical blogging last post first was reversed so the postings are correct by date and proceed forward in time. WordPress is a highly flexible CMS with the ability to create custom fields and templates. All the photographs display which camera was used and the GPS coordinates of the location. Kayaking Rideau uses Google Analytics as well as Adsense though more as an exploration at this stage.